Thank you for all the nice comments on my last post regarding Door County Cherry Baskets!!! I blushed every time I read them!! I tried to respond to all the comments, but there were several of you that were No-Reply commenters. Meaning I have no way to email you back. Some of you even asked questions that were no-repliers. If you did not hear from me, that is probably the reason...or I apologize if I may have missed you. 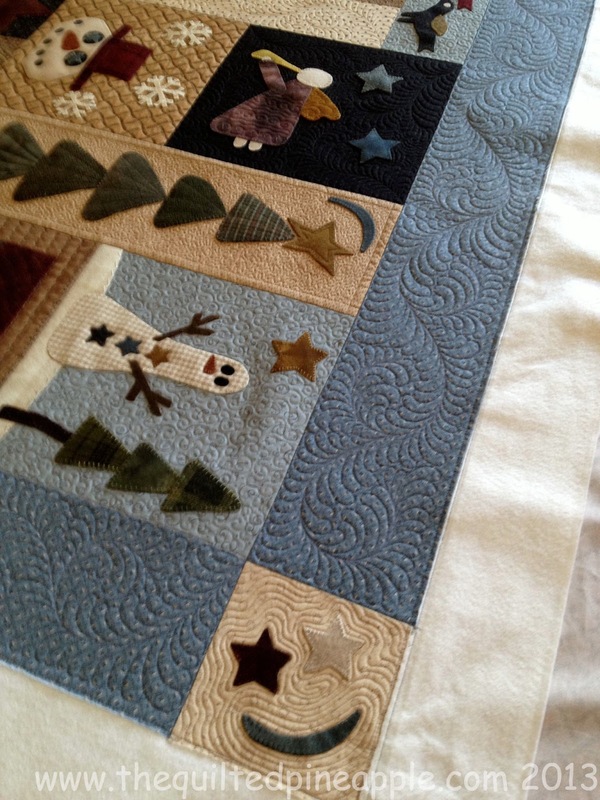 The quilt is wool applique on cotton. 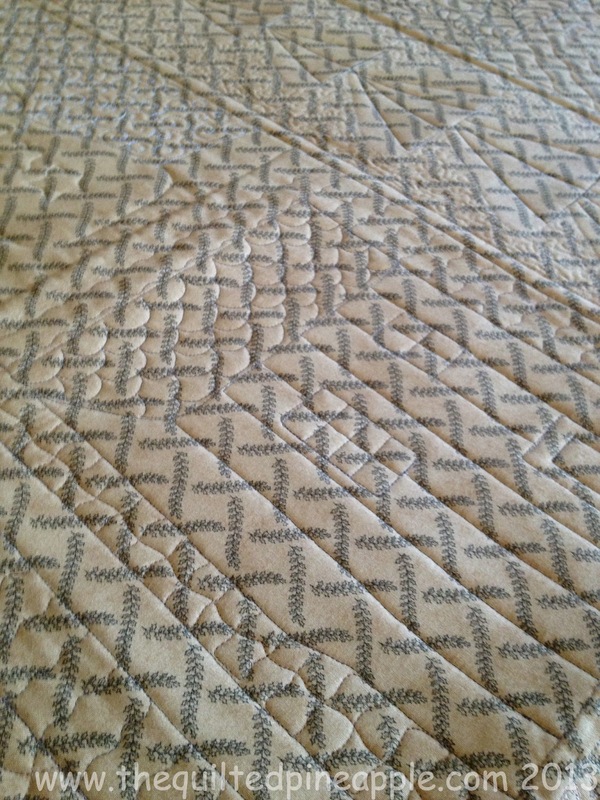 I used the fabric as a guideline for the quilting. 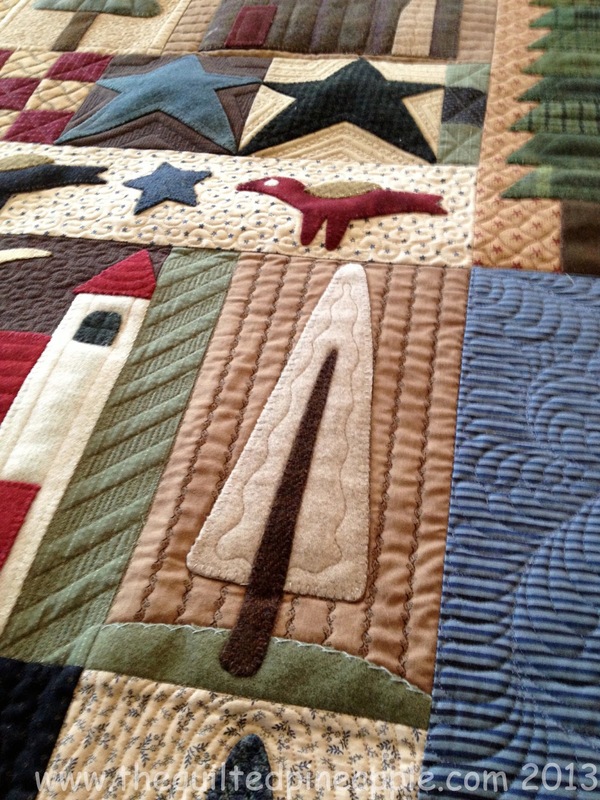 Some of the blocks were big, making them really cool!! 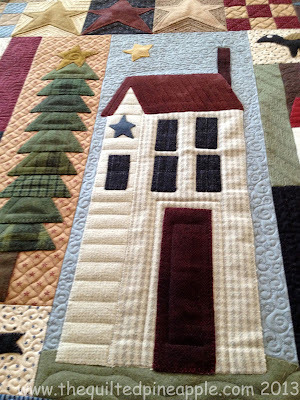 This house block was a favorite. I quilted a clapboard roof and cobblestone chimney. Teeny, tiny feathers...love them. I put a pin on there, so you could have reference of their size. Smoke coming out of the chimney. 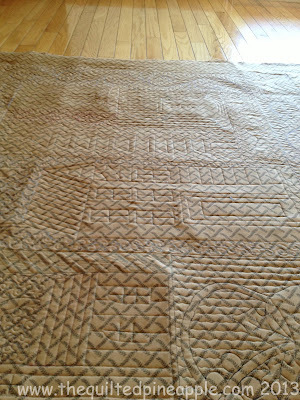 I loved all the quilting on the back, but had a terrible time capturing it because the lighting was not ideal. 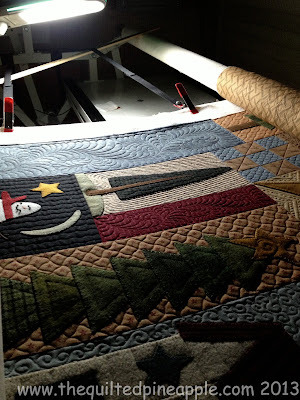 I am going through my photos of DCCB, hopefully I can come up with a quilt process post. My photos are not very tutorial friendly after looking at them. Oh my gosh! Linda, I've been seeing bits of this Instagram, but this is just amazing! Holy goodness! I love all the details in the quilting :) Happy days! Fabulous! 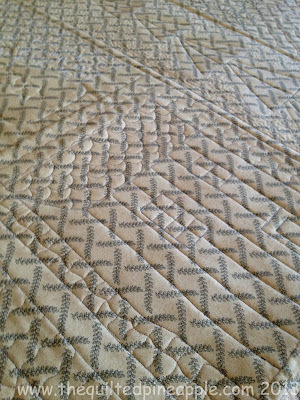 I don't think I have ever seen anything quilted so beautifully! It must be so difficult to send it back to its owner. Her piecing and applique are stunning as well. Gorgeous! 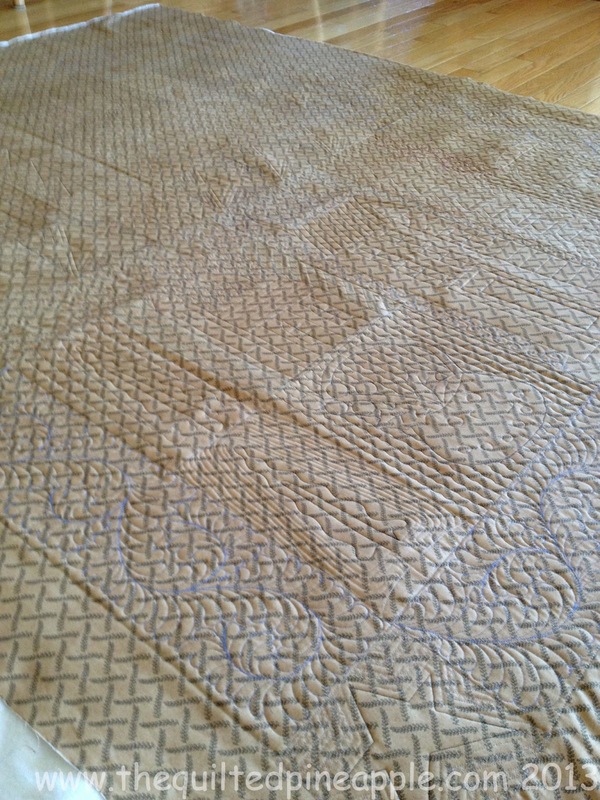 Lovely, lovely quilting. :) There are some tiny feathers and pebbles in there! 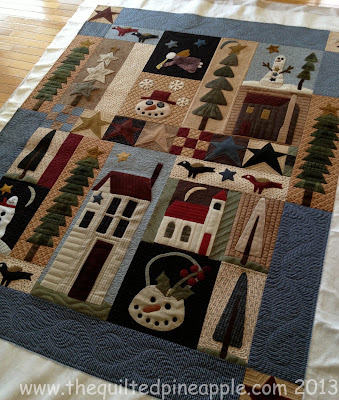 Sweet quilt and all the more beautiful because of your quilting. 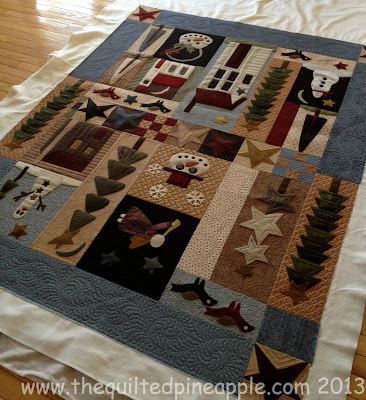 I love the variety of your quiltwork in this. You put so much thought into your work. If someone comes knocking on your door at dinner time on Friday's it'll be me. I LOVE perogies but have never had handmade fresh ones. 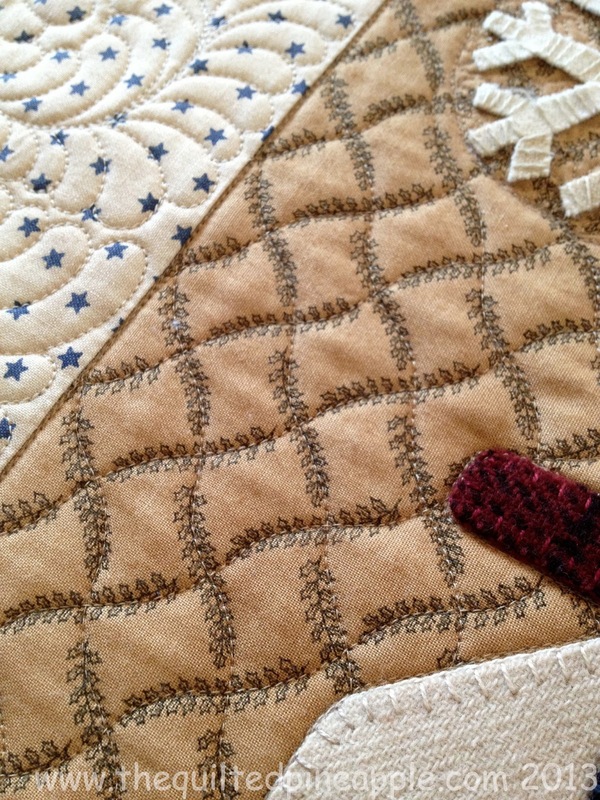 You can photograph your quilts upside down or right side up and they're gorgeous. I love how you let the fabric speak to you as well. 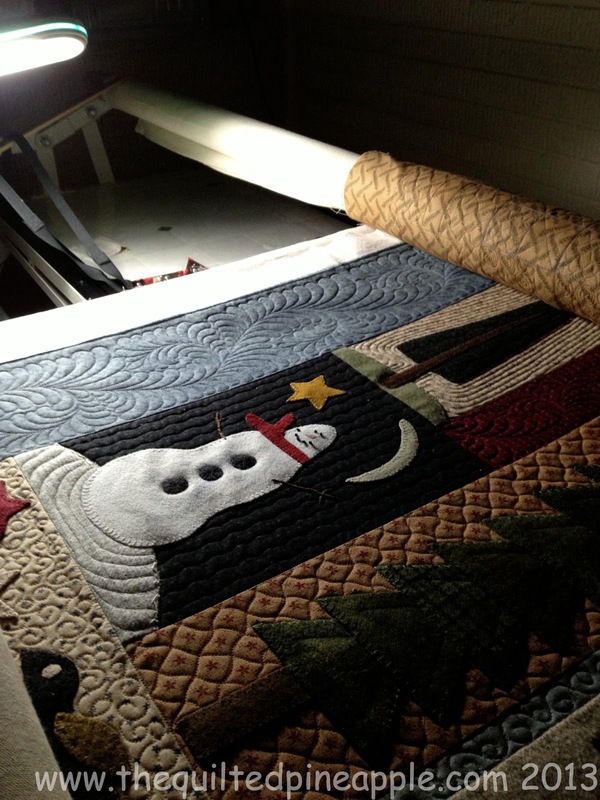 I guess you're the quilt whisperer. Hey guess what? Jan Patek the designer of this quilt is also a fabric designer? 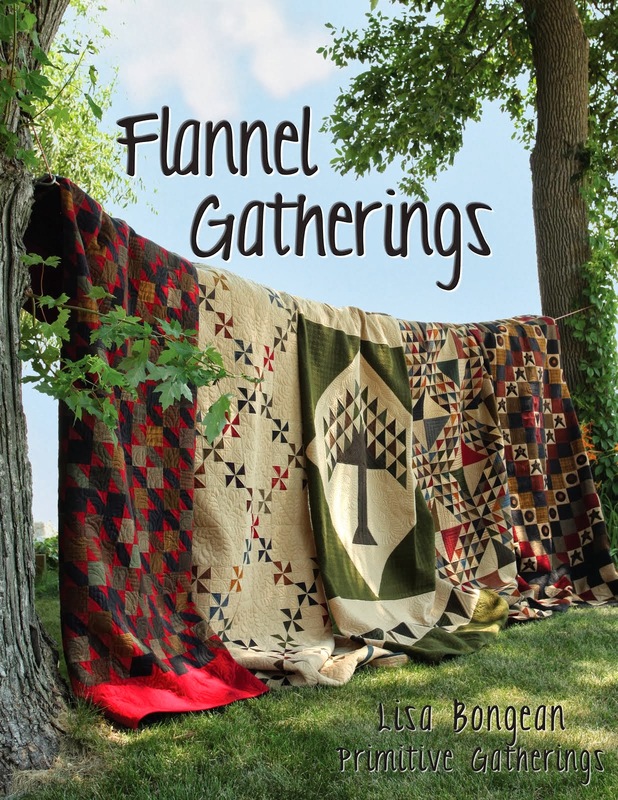 Do you think she needs or wants to sell some fabric? 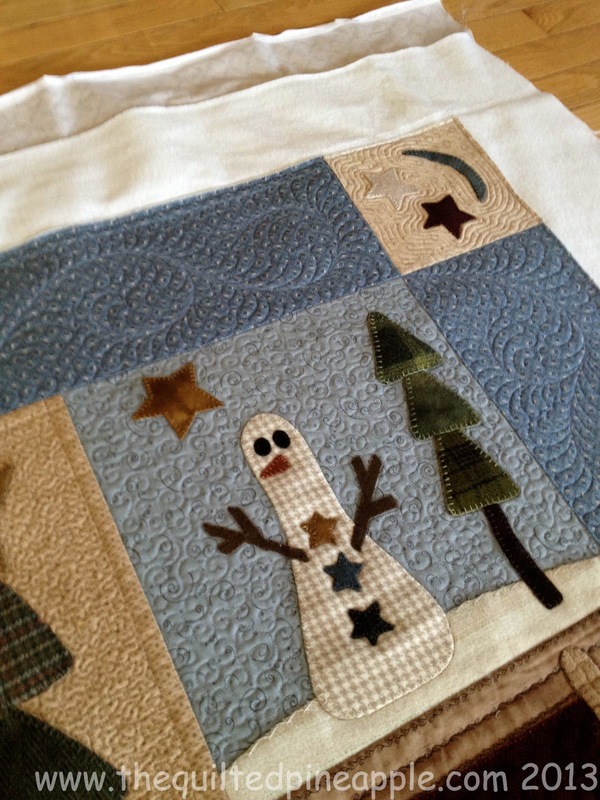 The quilt is fun, whimsical and meant to enjoy...too bad we have to say negative things to help us feel better that we might not be able to quilt as good as Linda...we all have our gifts...We know what Linda's is!!! So beautiful! I passed on this one and now I am so sorry I did! You are right.... the online pic did nothing for this quilt but your quilting is totally amazing! Amazing! Amazing! Some day I really do hope to be as good. 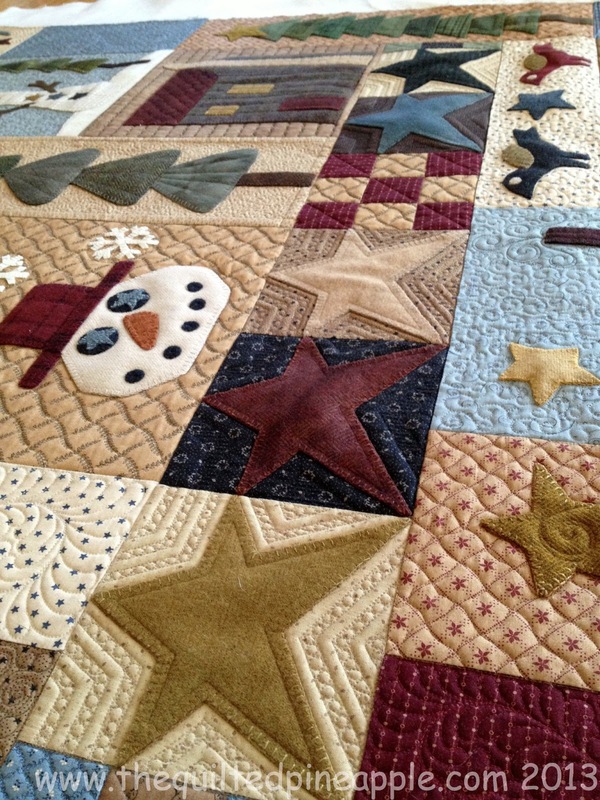 That is a fun quilt and your quilting is so amazing. I always get stuck on design ideas for block quilts with applique, you help me to see the possibilities and hopefully I can do more quilting in the future. I love how you quilted the star blocks! Thanks for the idea! 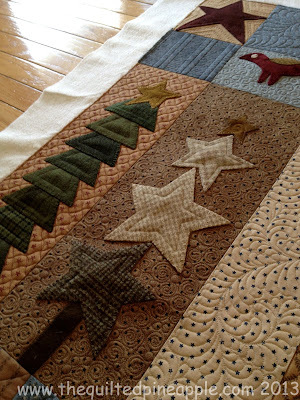 I'm getting ready to quilt a star quilt and definitely need some ideas. That is one amazing quilt job. 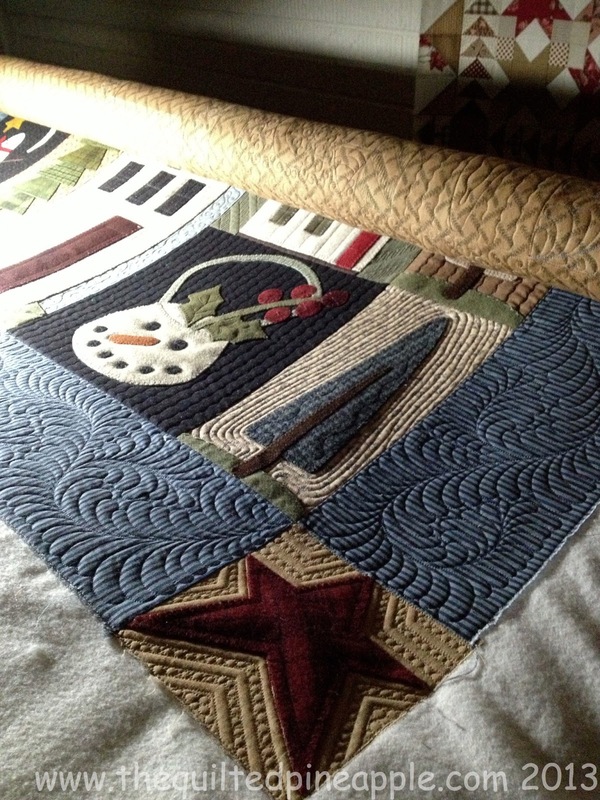 You made that quilt into a work of art with your quilting. 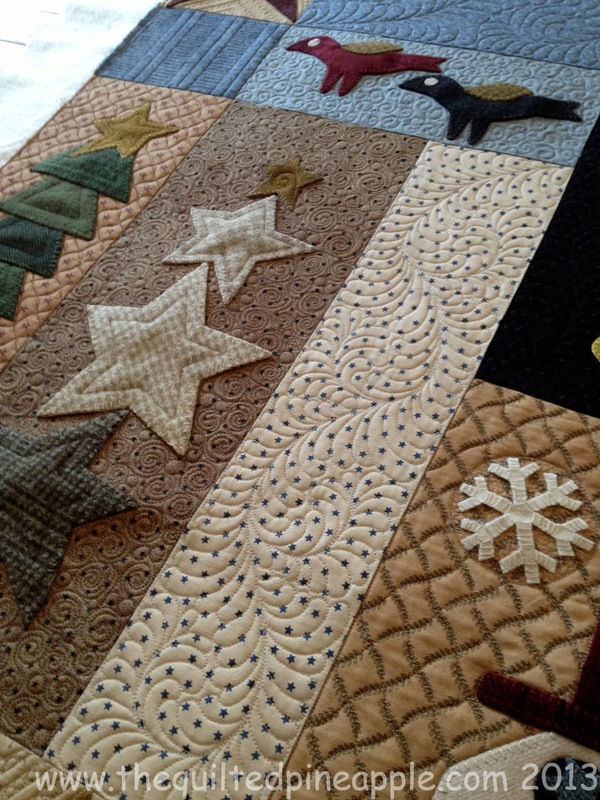 Incredible quilting job! 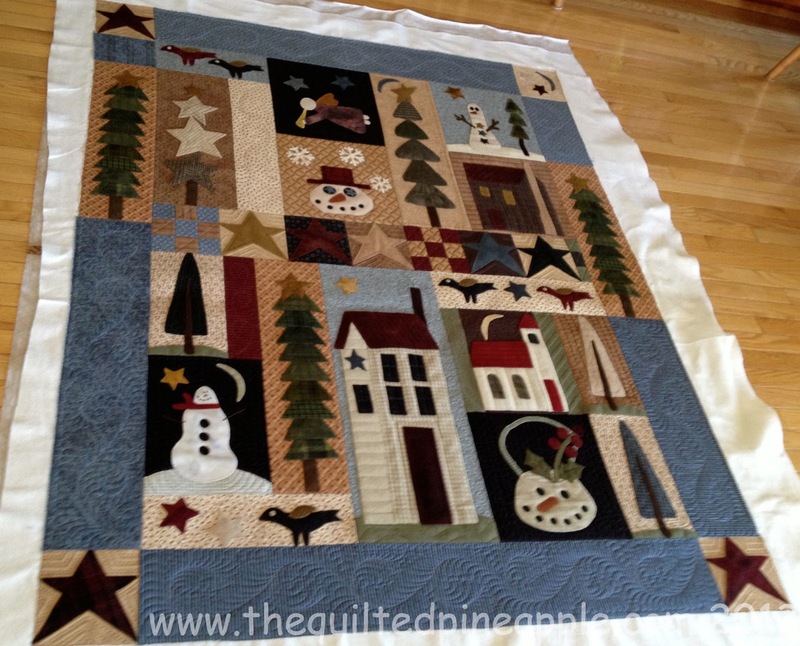 The quilt is beautiful and your choice of quilting designs have really enhanced an already lovely project ! 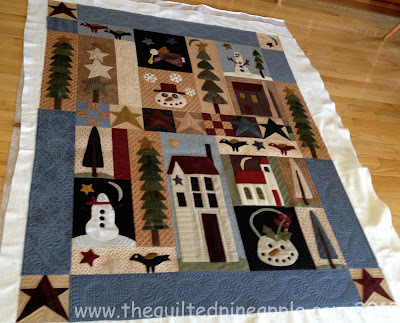 I love your quilting and the quilt is sooooo cute! Amazing, Amazing as usual. . .both this post and the last one. 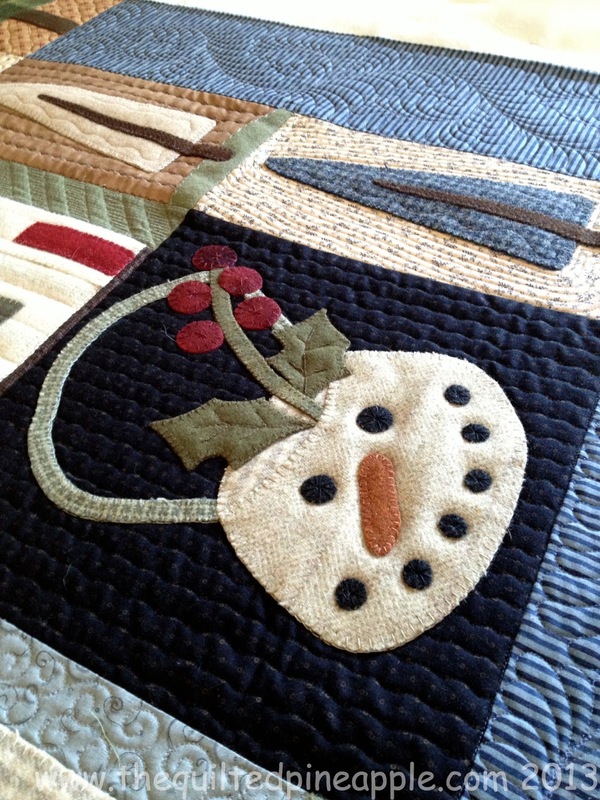 I just drool over your artistic touches! Awesome! 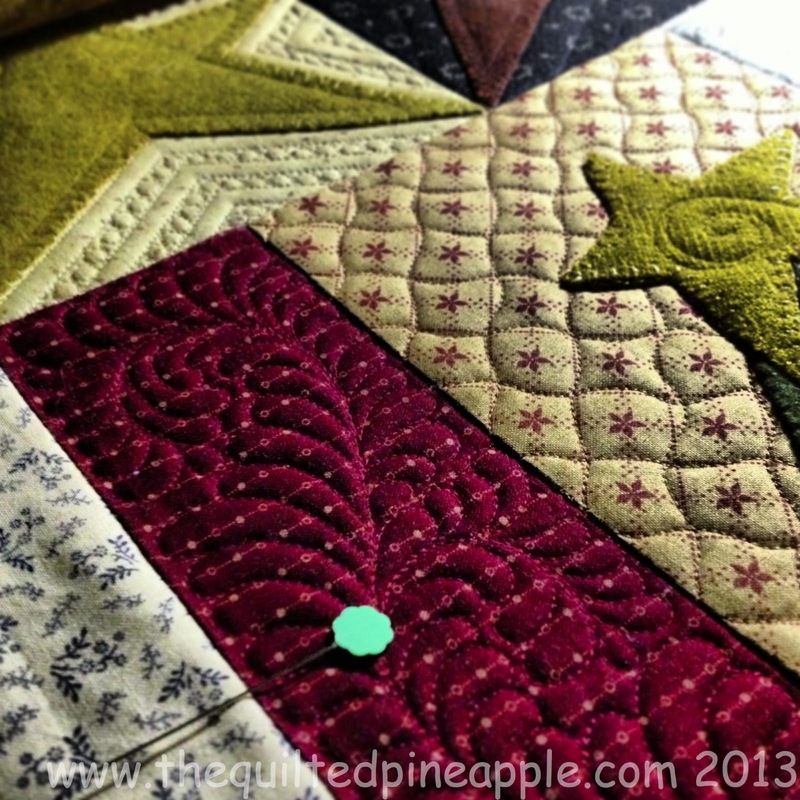 I always look forward to a new posting of your quilting. They never disappoint. 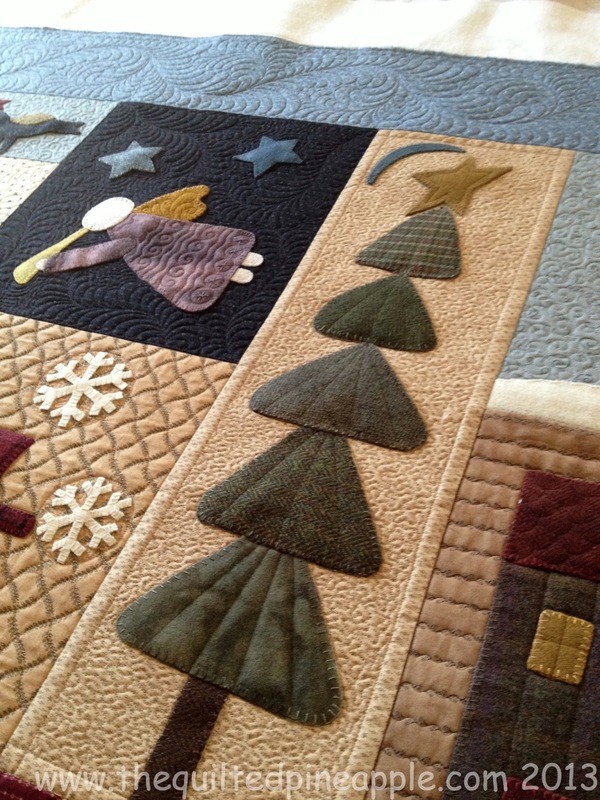 You are very creative with your quilting choices. Beautiful!! That is a beautiful quilt. But the quilting that you did made that an heirloom for the family that owns in. My goodness that quilting is just simply amazingly beautiful! That's a lot of thread changes! 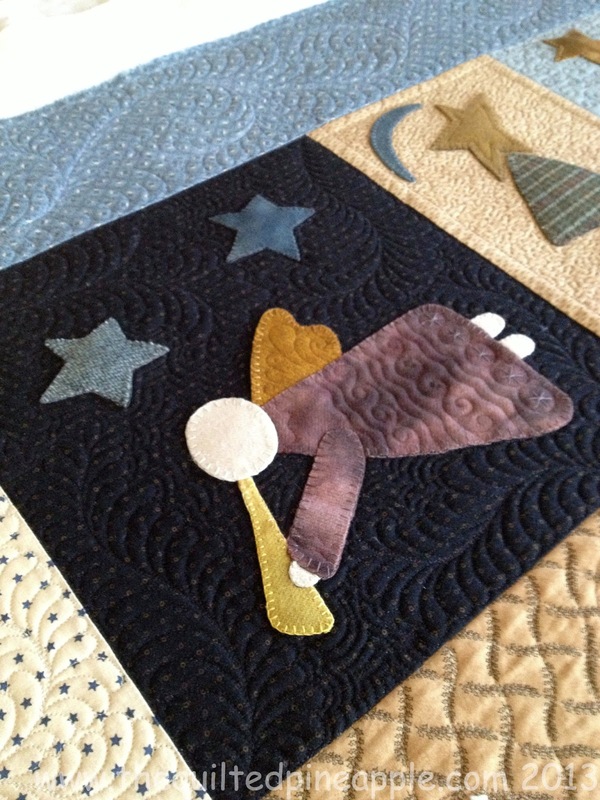 Beautiful quilting and yes those are tiny feathers, wow! 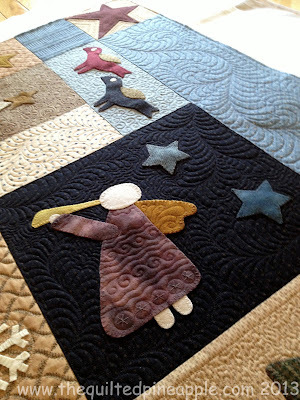 Wonderful done in wool! 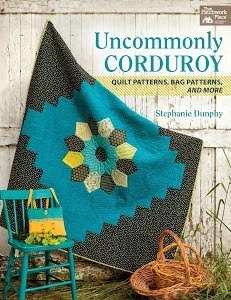 I have looked online at this pattern set a couple dozen times but have not taken the plunge to purchase. More amazing quilting .... your quilting adds so much to the quilt! 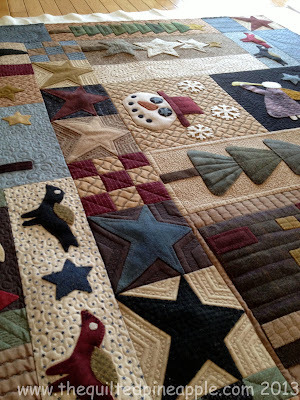 I just love looking at your quilting and I hope I am at a show where one of your quilts will be in a booth or in the show. Thank you so much for sharing your quilting with us! I didn't want your photos to end! 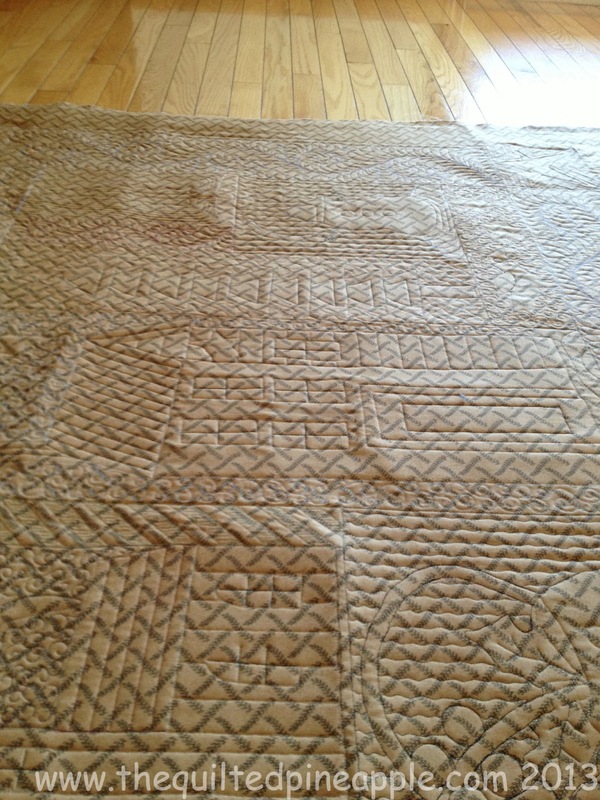 Jan's "space" makes a wonderful blank canvas for your creativity. LB's beautiful wools and handwork on this quilt "dance". It is a beautiful quilt,. Congratulations . As always, Linda, your work is awesome. 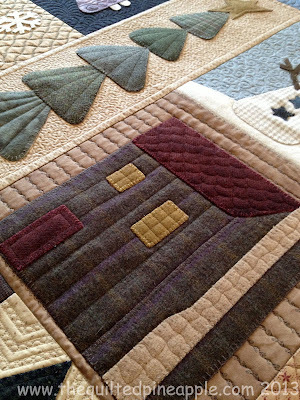 I just love all of the detail that you add to each block. I really love the stars - the entire thing is just stunning. 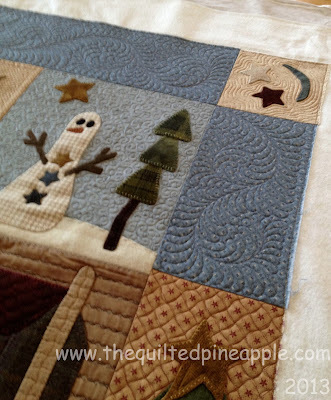 That blue is fabulous in that quilt. And oh my...the quilting.....wow! 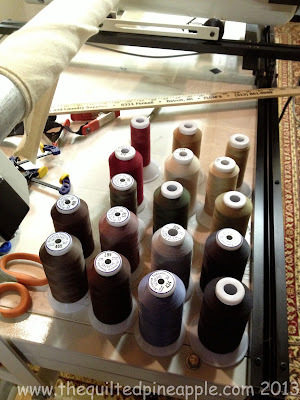 OK-- inquiring minds want to know.... How many color changes did you use as for as thread goes? Beautiful Job. 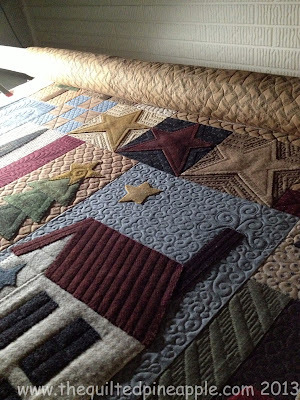 You've outdone yourself again, Linda! I just love all the little details. Isn't SO Fine just the best thread, too! You're so brave to use so many colors! Happy Pierogi's! Mr. Squash wants to be adopted by your MIL! 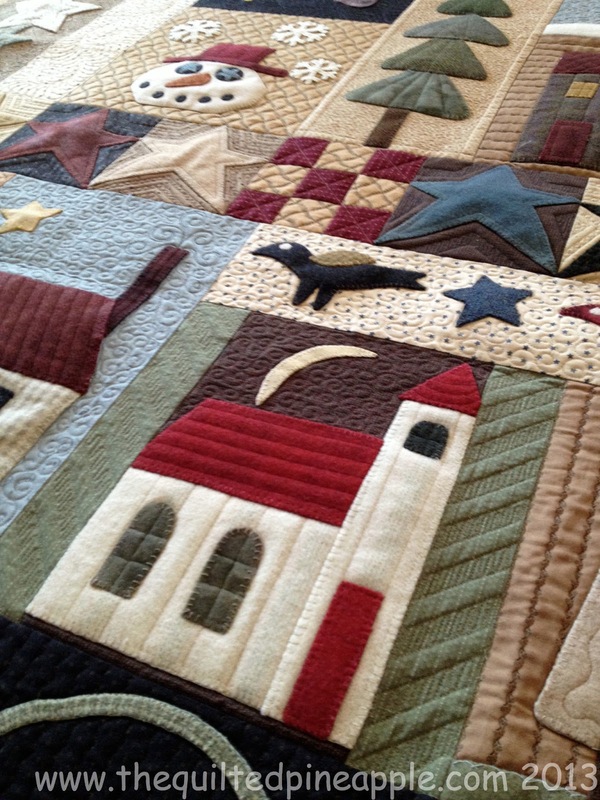 Everytime I see one of your quilting creations, I tell you that you've outdone yourself. But THIS time you've really done it. I keep looking at those pictures and am in total awe of your talents. Now you have me thinking that I need to sign up for the BOM thru PG. 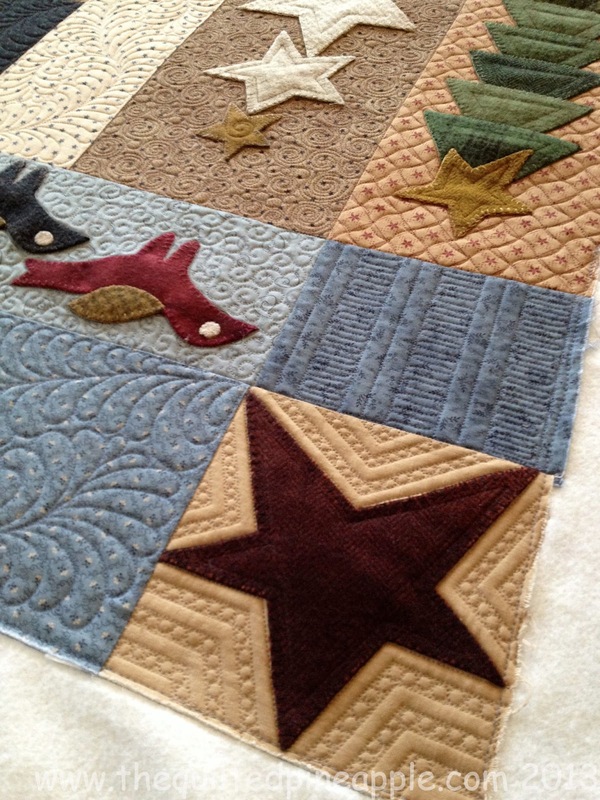 With their color choices and your quilting, the finished project is to die for! Congrats on another success! You are just really coming into your own, my friend. Love it. Keep up the great work. Missing you! Oh, and I love pierogi, so anytime you have an extra space at the table.....LOL! I can tell that your really really love this quilt! I think you do need one for yourself! Making pierogi?? My son would go crazy for that. Funny enough, living in Ireland, there are a lot of Polish immigrants here and a lot of Polish food, but my son prefers the pierogi that we get when we're back in the US. 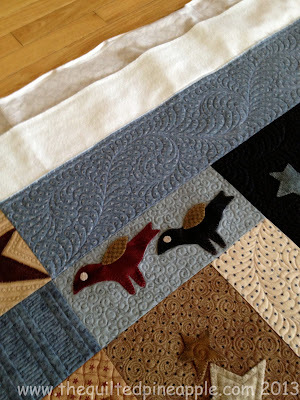 I just happened to stop by and read your blog. My socks flew across the room as I studied the pictures of your quilting!! Oh my! It is beyond words beautiful!! Thank you for sharing your wonderful talent. I'll be back to fill my eyes and heart again! Elle est magnifique cette courtepointe. Je suis admirative devant tous ce travaille. Bravo et encore félicitations d'une française qui ne sait malheureusement l'anglais. Bravo, je suis admirative devant ce quilting parfait.